Aerosol Delivery System (VADS) With Micro Vented Ports (MVP)This special system utilizes the Salter Nebu-Tech®HDN® or the 8900 series Nebulizers and a Salter Aerosol mask with elastic head strap in several special configurations. They are engineered with special valves or vents to maximize aerosol delivery to the patients nose and mouth while diminishing the incidence of aerosol irritating the patients eyes.Available in….Pediatric, and Adult sizes. 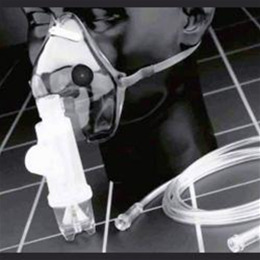 A combination of Salter Labs® Nebulizers coupled with specially designed and constructed masks, to diminish aerosolized medication entering a patient’s eyes.